Fair glowing and healthy facial skin is a natural desire of every person. Beauty conscious women spend a lot of money on buying chemically prepared commercial facial masks but often don't get the desired results. However, if you have been tired by wasting money on expensive commercial face masks then go with natural homemade fruit face masks. 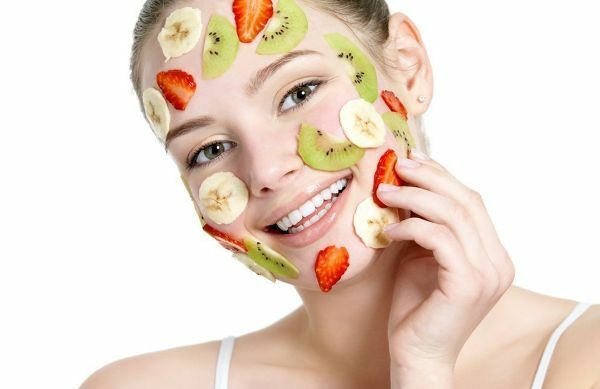 These natural fruit masks can give you the better result even within lower budget. Here we have a collection of best fruit face masks. In the following lines we are going to discuss how these fruit masks help to get fair and glowing skin. According to given instructions, you can apply them even at home and get the maximum skin benefits from their natural ingredients. Bananas are rich in vitamin A, B and E and hence works as an anti-aging agent. A fresh mashed banana facial can do wonders for your skin and give fair glowing and gives you naturally soft skin within few days.You can add some honey/lemon if you have acne. Now massage this mixture on your face and neck for 3-5 minutes. Let it stay for 15-20 minutes and then wash off after 15-20 minutes. Mango is called the king of fruits for not just its taste but also for health benefits. The soft pulpy fruit has an amazing effect on skin too. Rich in Vitamin-A and rich antioxidants(Vitamin C and Vitamin E), it fights against skin aging, regenerates skin cells, restores the elasticity of skin and give your naturally glowing skin. Mix 1 teaspoon honey and 1 teaspoon curd with 2 tablespoons mango pulp. Give your skin a massage with this pack for 2-3 minutes and keep this on your face for at least 10-15 minutes. Remove this pack by splashing water. Lemon is a natural skin bleaching agent and help a lot to give you a fair glowing and healthy skin. Take 1 tablespoon of lemon juice and mix with half teaspoon of honey. Apply this mixture on your face and neck for 10-15 minutes and then rinse off with fresh water. Strawberries are rich in anti-oxidants and help to get healthy, glowing and rejuvenated skin. Grind some strawberry pulp with a little water and apply it to your clean face and neck. Wash off after 15 minutes. Vitamin E present in avocado gives a natural glow to your skin. The proteins and fats of avocado help in balancing the moisture of your skin and prevent wrinkles as well. Mix an egg yolk with avocado and apply it on your skin. Keep it for 20 minutes. Then wash your skin with clean water. It is the best facial for dry skin during summer season. Delicious apricots are rich in vitamin A, B and C, which makes them a great ally in the fight against wrinkles. Choose 3-4 apricots, peel them, remove the seeds and pass them to pulp.Crush the fruit and apply the resulting paste on your face and neck for 15 minutes. Remove with lukewarm water. Peach has alpha hydroxy acid (AHA) which supplies nutrition to skin and removes dead skin cells. It reduces wrinkles and tightens your skin. Mix the pulp of peach with curd and apply this mixture on your face. Slightly massage in downward to upward direction for 5 minutes. Leave this pack on face for 10-15 minutes and then rinse off with clean water. Papaya and are rich in vitamins C and E. Papaya face masks will exfoliate your skin while helping to eliminate and prevent blemishes. Peel the papaya and remove the seeds. Cut the fruit into cubes, and puree it in a blender or food processor. Combine it with oatmeal, egg whites and honey for a face mask that will work wonders by cleansing, exfoliating, toning and hydrating your skin. Tomatoes help in maintaining the oil balance of your face and leave a cooling effect on your skin. Tomato facial mask not only cleanse the skin but also help in clearing the acne scars and pimple. Squeeze a tomato and apply on your skin. Massage for 2-3 minutes.The seeds of tomato will give a scrubbing action during massage. After massage leave this for 10-15 minutes and then wash off with clean water. If you have sensitive skin then Watermelon facial mask is really best for your skin.This refreshing, cool watermelon anti-pore mask not only contracts the pores but also provide moisture and deeply cleanse your skin. (i) First of all, before applying any fruit mask, properly clean your skin by using any mild soap and fresh water. Pat dry your skin using a clean towel. Now your face is ready to apply any fruit mask. (ii) Relax while you have it on your face, because some fruit masks are very slippery and they may slide off. (iii) A lot of fruits contain citric acid. Lemon, lime and orange (juice) in specific. When you use them in a skin treatment always be careful with how much you use. Too much can cause acid burns.If you have sensitive skin be extra aware with these ingredients. (iv) Always do a patch test on a small area of skin (e.g. behind the ear) to see how your skin reacts to separate ingredients. If it creates an allergic effect then avoid that ingredient or fruit mask. (v) Always use a freshly prepared fruit mask.